MARTINSBURG, W.Va. (AP) — Former West Virginia Delegate Mike Folk says he's running for governor. The Berkeley County Republican announced the campaign in an email Tuesday. Folk is an airline pilot and served three terms in the House of Delegates. He lost to Democratic incumbent John Unger in a state Senate race in November. WHITE SULPHUR SPRINGS, W.Va. (AP) — Midway through his first term, West Virginia Gov. Jim Justice says important, long-term matters remain unfinished on his to-do list. So he announced Monday he'll seek re-election in 2020. "The further I go, the more I believe just this: I believe there's work still to be done," Justice said in announcing his plans at the White Sulphur Springs Civic Center. CHARLESTON, W.Va. (AP) — Ex-Congressman Evan Jenkins and former House of Delegates speaker Tim Armstead were elected Tuesday to keep their seats on the West Virginia Supreme Court, where they will complete the unexpired terms of former justices caught up in a scandal over court spending. CHARLESTON, W.Va. (AP) — Two prominent Republican politicians are among a pack of attorneys and judges competing Tuesday for a pair of West Virginia Supreme Court positions vacated by justices caught up in a scandal over spending by the court. Ex-U.S. Rep. Evan Jenkins and former House of Delegates speaker Tim Armstead were appointed by GOP Gov. Jim Justice to fill the seats until the election. Now both are running to fill the unexpired terms on West Virginia's highest court. Two Republicans politicians will serve as temporary justices on the West Virginia Supreme Court after a group of judicial stand-ins rejected challenges to their appointments to replace departed justices. LOUISVILLE, Ky. (AP) — West Virginia Governor Jim Justice's family coal companies are breaching their environmental responsibilities, according to Kentucky regulators, who are seeking millions in additional fines for surface mining areas that haven't been cleaned up. Trump praises service members during charity dinner in W.Va.
WHITE SULPHUR SPRINGS, W.Va. (AP) — President Donald Trump celebrated active-duty service members and veterans during a military tribute Tuesday on the eve of Independence Day. Delivering remarks at a "Salute to Service" charity dinner at the Greenbrier resort in White Sulphur Springs, West Virginia, Trump praised "Americans of every generation" who have served in the armed forces. President Donald Trump celebrated active-duty service members and veterans during a military tribute on the eve of Independence Day. The president spoke Tuesday during a "Salute to Service" charity dinner at the Greenbrier resort in White Sulphur Springs, West Virginia. He praised "Americans of every generation" who have served in the armed forces. Is Evan Jenkins just the consummate opportunist? According to the current ads, West Virginia has three prominent Republicans running in the primary to face Senator and former governor Joe Manchin for his seat in the U.S. Senate. They are U.S. Rep. Evan Jenkins (Huntington), Attorney General Patrick Morrisey (Charleston), and former coal baron Don Blankenship (Nevada). Milt Hankins: Is Evan Jenkins just the consummate opportunist? 1. JUSTICE-GOP: Gov. Jim Justice announces at a rally with President Donald Trump in Huntington that the governor is switching from the Democratic to the Republican party. 2. ROAD BONDS: In October, voters overwhelmingly approve a $1.6 billion road bond package after lawmakers pass taxes and fees to support some repairs and bond repayments. CHARLESTON, W.Va. (AP) — U.S. Sen. Joe Manchin has assembled his campaign team for the 2018 election. The West Virginia Democrat announced Wednesday that longtime friend Larry Puccio will serve as his re-election campaign's senior adviser. Puccio served as chief of staff when Manchin was governor and is a former chairman of the state Democratic Party. CLARKSBURG, W.Va. (AP) — Gov. Jim Justice said Friday he hasn't yet endorsed anyone for next year's race for the U.S. Senate seat currently held by Democrat Joe Manchin. Elected last year as a Democrat with Manchin's support, Justice recently switched to the Republican Party — an announcement he made with President Donald Trump at a Charleston rally in August. FAIRLEA, W.Va. (AP) — Democratic U.S. Sen. Joe Manchin says he will not join Republican President Donald Trump's administration. An “in-Justice” has been committed by a one-time ally of Dannel P. Malloy, head of the nation’s suddenly-shrinking Democratic Governors Association. Malloy is in Aspen, Colo., through Saturday for a meeting of his blue-state counterparts, but there is a conspicuous absence: West Virginia’s Jim Justice. President Trump sought to turn around another day of bad news — from revelations of a newly impaneled grand jury, to leaked phone conversations with world leaders — by demanding that investigators probing the Russian election meddling scandal instead target Hillary Clinton. “What the prosecutors should be looking at are Hillary Clinton’s 33,000 deleted emails,” Trump said to huge cheers and chants of “Lock her up!” in West Virginia last night. CHARLESTON, W.Va. (AP) — Only six legislators, all Democrats, showed up in response to Gov. Jim Justice's invitation to meet Wednesday behind locked doors to resolve the state budget crisis, according to the governor's office. CHARLESTON, W.Va. (AP) — A West Virginia delegate said Friday he'd like to see lawmakers discuss legalizing medical marijuana, despite the House speaker's recent declaration that such legislation won't gain a foothold this year. CHARLESTON, W.Va. (AP) — Coal magnate Jim Justice was sworn in Monday as West Virginia's governor, the 34th man to hold the post over a century and a half. Elected as a Democrat in his first run for statewide office at age 65, Justice then outlined some proposals to help West Virginia's teachers, highways, jobs, tax receipts, forestry and manufacturing. Gov. Jim Justice has proposed measures to help West Virginia's teachers, highways, jobs, tax receipts, forestry and manufacturing. CHARLESTON, W.Va. (AP) — Gov.-elect Jim Justice says his campaign spokesman will be the press secretary in his administration when he takes office in January. Grant Herring has also been handling communications for the incoming governor's transition team. Herring previously worked for U.S. Sen. Mark Pryor of Arkansas and Virginia Lt. Gov. Ralph Northam. MORGANTOWN, W.Va. (AP) — West Virginia Gov.-elect Jim Justice spent $5.1 million in his mostly self-funded winning race as a Democrat, campaign finance reports show. MORGANTOWN, W.Va. (AP) — Three West Virginia representatives to the electoral college are clear and unequivocal that they will be voting for Donald Trump to be the next U.S. president regardless of emails, letters and calls urging them not to. The state's five electoral college representatives were all chosen earlier this year by West Virginia's Republican Party. They got the nod after their party's candidate won a majority of the state's popular vote. CHARLESTON, W.Va. (AP) — Governor-elect Jim Justice has appointed his election campaign's treasurer as his chief of staff. CHARLESTON, W.Va. (AP) — West Virginia's incoming Democratic governor says he received a weekend phone call from Republican President-elect Donald to discuss how to revive the slumping coal industry. Gov.-election Jim Justice said in a statement that the 15-minute call focused on how the two could cooperate in efforts to put miners back to work. It said Trump "made clear that he won't forget about West Virginia when it comes to our nation's energy policies." CHARLESTON, W.Va. (AP) — Donald Trump's big victory in West Virginia helped some Republicans along but didn't completely tilt things in favor of the GOP. Before Tuesday's election, the GOP held just one of the six statewide offices. Now they'll have four with Democrats holding the other two. Billionaire Jim Justice has extended the Democratic Party's streak of winning the governor's race to two decades. CHARLESTON, W.Va. (AP) — At the same time West Virginia overwhelmingly picked Republican billionaire political outsider Donald Trump on Tuesday, the state widely preferred a Democratic billionaire political outsider for governor, Jim Justice. In a stark split-ticket statement, the Mountain State scoffed off Justice's political party label, picked the two businessmen who said the current system is broken, and left its state government in almost the same divide it's currently in. CHARLESTON, W.Va. (AP) — Billionaire businessman Jim Justice will become West Virginia's next governor, a critical split-ticket win for Democrats in a state where Republican Donald Trump cruised to victory. Republicans and Democrats each retained governorships Tuesday in hard-fought battles in Indiana and West Virginia as voters picked chief executives in a dozen states. The governors' contests were part of a battle for statehouse supremacy that included nearly 6,000 state legislative elections. Heading into Tuesday, Republicans controlled more than two-thirds of the nation's legislative chambers, as well as 31 of the 50 governors' offices. CHARLESTON, W.Va. (AP) — Democratic billionaire coal businessman Jim Justice wins West Virginia governor's race. 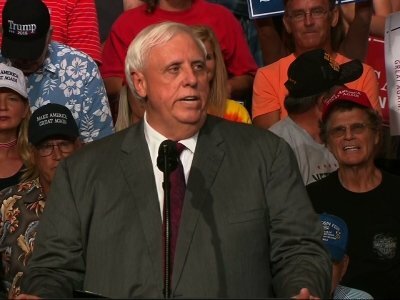 BECKLEY, W.Va. (AP) — Democratic gubernatorial candidate Jim Justice says four metallurgical coal mines in southern West Virginia are reopening and will put 375 people to work. The Register-Herald (http://bit.ly/2fjOaQV) reports Justice made the announcement Thursday, saying his company, Justice Corp., estimates it has already filled about a third of the jobs.